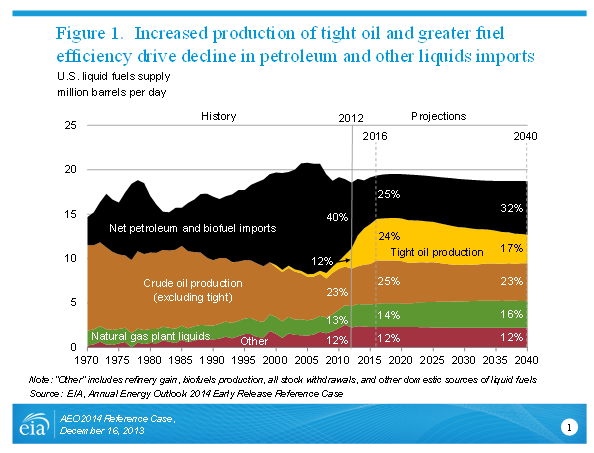 The Annual Energy Outlook 2014 (AEO2014) Reference case released today by the U.S. Energy Information Administration (EIA) presents updated projections for U.S. energy markets through 2040. "EIA's updated Reference case shows that advanced technologies for crude oil and natural gas production are continuing to increase domestic supply and reshape the U.S. energy economy as well as expand the potential for U.S. natural gas exports," said EIA Administrator Adam Sieminski. "Growing domestic hydrocarbon production is also reducing our net dependence on imported oil and benefiting the U.S. economy as natural-gas-intensive industries boost their output," said Mr. Sieminski. Domestic production of oil and natural gas continues to grow. Domestic crude oil production increases sharply in the AEO2014 Reference case, with annual growth averaging 0.8 million barrels per day (MMbbl/d) through 2016, when domestic production comes close to the historical high of 9.6 MMbbl/d achieved in 1970 (Figure 1). While domestic crude oil production is projected to level off and then slowly decline after 2020 in the Reference case, natural gas production grows steadily, with a 56% increase between 2012 and 2040, when production reaches 37.6 trillion cubic feet (Tcf). The full AEO2014 report, to be released this spring, will also consider alternative resource and technology scenarios, some with significantly higher long-term oil production than the Reference case. Higher natural gas production also supports increased exports of both pipeline and liquefied natural gas (LNG). In addition to increases in domestic consumption in the industrial and electric power sectors, U.S. exports of natural gas also increase in the AEO2014 Reference case (Figure 2). 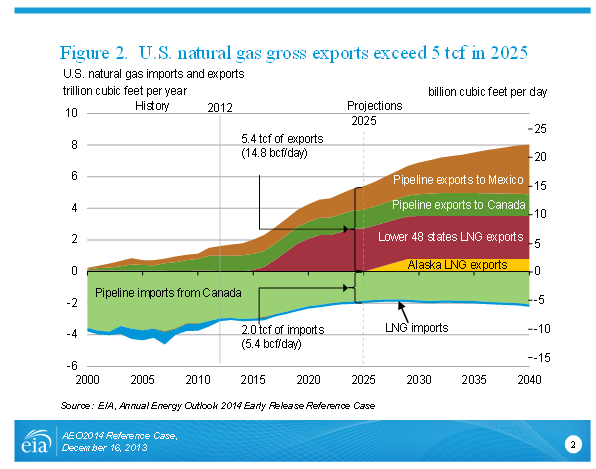 U.S. exports of LNG increase to 3.5 Tcf before 2030 and remain at that level through 2040. Pipeline exports of U.S. natural gas to Mexico grow by 6% per year, from 0.6 Tcf in 2012 to 3.1 Tcf in 2040, and pipeline exports to Canada grow by 1.2% per year, from 1.0 Tcf in 2012 to 1.4 Tcf in 2040. Over the same period, U.S. pipeline imports from Canada fall by 30%, from 3.0 Tcf in 2012 to 2.1 Tcf in 2040, as more U.S. demand is met by domestic production. Natural gas overtakes coal to provide the largest share of U.S. electric power generation. Projected low prices for natural gas make it a very attractive fuel for new generating capacity. In some areas, natural-gas-fired generation replaces power formerly supplied by coal and nuclear plants. 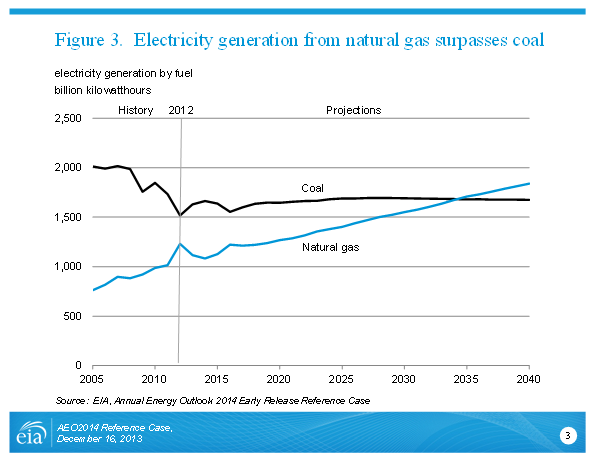 In 2040, natural gas accounts for 35% of total electricity generation, while coal accounts for 32% (Figure 3). Generation from renewable fuels, unlike coal and nuclear power, is higher in the AEO2014 Reference case than in AEO2013. Electric power generation from renewables is bolstered by legislation enacted at the beginning of 2013 extending tax credits for generation from wind and other renewable technologies. The Brent crude oil spot price declines from $112 per barrel (bbl) (in 2012 dollars) in 2012 to $92/bbl in 2017. After 2017, the Brent spot oil price increases, reaching $141/bbl in 2040 due to growing demand that requires the development of more costly resources. World liquids consumption grows from 89 MMbbl/d in 2012 to 117 MMbbl/d in 2040, driven by growing demand in China, India, Brazil, and other developing economies. Total U.S. energy-related CO2 emissions remain below their 2005 level (6 billion metric tons) through 2040, when they reach 5.6 billion metric tons. CO2 emissions per 2005 dollar of GDP decline more rapidly than energy use per dollar, to 56% below their 2005 level in 2040, as lower-carbon fuels account for a growing share of total energy use. The Reference case projections from the Early Release Overview of the AEO2014 are available at http://www.eia.gov/forecasts/aeo/er/. The reference case projections include only the effects of policies that have been implemented in law or regulations. 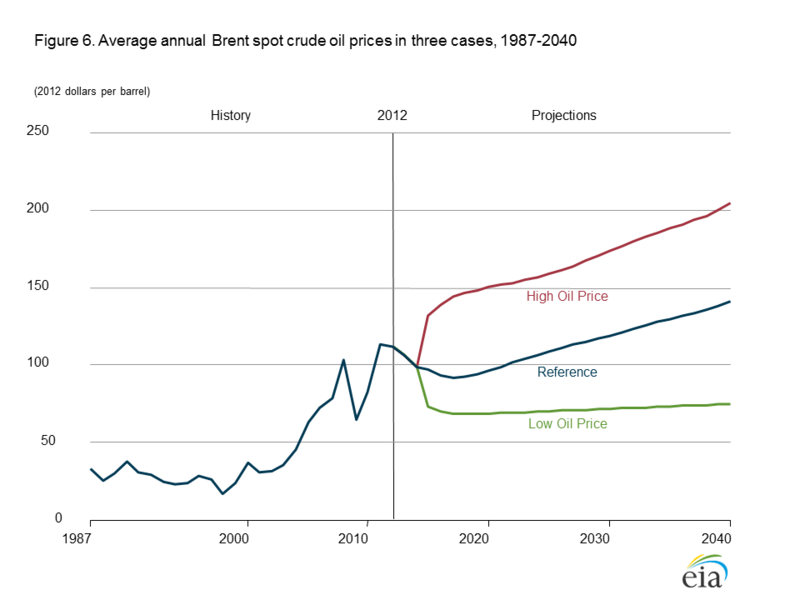 The full AEO2014 report, including projections based on differing assumptions regarding world oil prices, domestic hydrocarbon resources, the rate of economic growth, the characteristics of new technologies, and alternative policy scenarios, will be released in early 2014, along with regional projections.